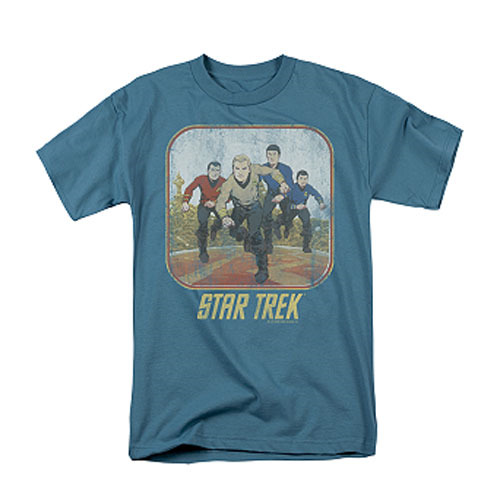 Star Trek Classic Crew Running Cartoon Star Trek T-Shirt. Feeling a little cartoonish? Just look at Kirk, Spock, McCoy, and Scotty! Show your pride for the Star Trek animated series with this 100% cotton, high-quality, pre-shrunk, slate-blue/gray Star Trek T-Shirt. Machine washable. Order yours today! See the Blue Star Trek Movie Uniform that's sweeping Starfleet!